The Pfalz is Germany’s second biggest wine growing region behind the Rheinhessen. It is known for the production of Riesling, Muller-Thurgau, Scheurebe, Pinot Noir, Pinot Blanc and Gerwurtztremeiner. The Pfalz has widely varying terroir conditions in comparison to the French region Alsace than to many German regions, partly due to the shelter offered by the mountain range that creates a border between France and Germany. This and the naturally innovative streak common to Pfalz wine producers mean that the Pfalz produce more varied wines than any other region in the Germany. The Pfalz, like many French regions was tended to by monks, who studiously developed the terroir, until Napoleon carved up the land and redistributed it among the local population. Wines from the Pfalz tend to be fruitier and yet less acidic than other German wines, with wines commonly displaying elements of honey, vanilla and citrus. 80 percent of Pfalz wines are white, with the majority of them being of a medium quality, and equal proportions being split between the noble and reliable Table wines, and the upper end of the quality wine market: the best of these are said to be the best in Germany. As with other German regions white wines dominate in the Pfalz, although Pinot Noir wines are produced in the region under the name ‘spatburgunder’. Pinot Blanc and Pinot Gris (French white grapes) are also grown under the names ‘weissburgunder’ and ‘rulander’. Along with Riezling, Silvaner and Gerwurtztraminer these grapes produce wines that vary greatly across the region according to terroir and the ability of the wine producer. Silvaner tends to produce run of the mill, reliable, drinkable, yet unimpressive whites, except in one case where it is mixed with Riesling to produce Scheurebe, which has a blend of strong citrus and vanilla flavours. The best known estate in the region is ‘Mullet-Catoir’ an estate often felt to be the best in Germany, and which is famed for the clarity of its flavours. Much sought after is the Schereube from this estate, amongst other varieties, which has characteristic grapefruit flavours. For a cheaper alternative try a 2003 Kulling-Gillot Scheurebe Kabinett or a 2004 Weingut Edgar Schäfer, for around £10 and £7 a bottle respectively. It must be noted that the Scheurebe is an acquired taste, having strong tastes of grapefruit – something which is itself an acquired taste! 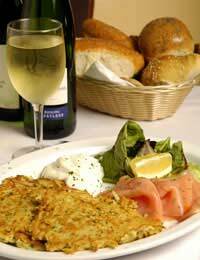 The Pfalz diet is typically German, and therefore weighted towards potato, meat and breads. However, in this region combinations of German wines and French style foods are often enjoyed, as well as German wines employing French style grapes. The Pfalz Pinto Noir is a suitable wine for combination with creamy French cheeses such as Camembert. One of the main benefits of Pfalz region wines is that variety and quality are offered at a good price. In this respect, and in light of the experimental approach taken by Pfalz producers, this region stands alone as one comparable with New World regions. The Pfalz is not held back by the stuffiness that pervades some old European national markets.